Last year, we reported on a Dutch proposal to launch so-called "Steve Jobs schools" for children, offering a peek at of Jobs' vision of how the iPad could help remake the educational experience. Spiegel now follows up (via AppleInsider) with a new report discussing the country's plans to open 11 such schools this August. Some 1,000 children aged four to 12 will attend the schools, without notebooks, books or backpacks. Each of them, however, will have his or her own iPad. There will be no blackboards, chalk or classrooms, homeroom teachers, formal classes, lesson plans, seating charts, pens, teachers teaching from the front of the room, schedules, parent-teacher meetings, grades, recess bells, fixed school days and school vacations. 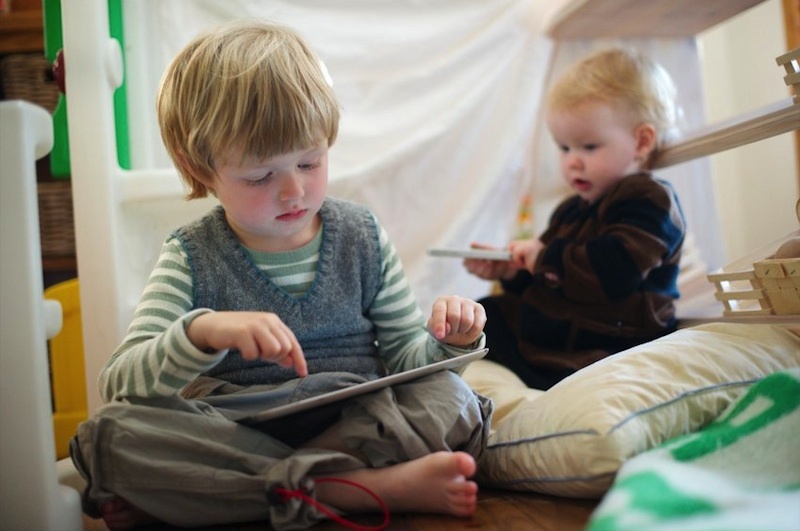 If a child would rather play on his or her iPad instead of learning, it'll be okay. And the children will choose what they wish to learn based on what they happen to be curious about. The article highlights the flexible nature of the schools with a look at an upcoming school being prepared in the city of Breda. The school building itself will be open from 7:30 AM to 6:30 PM every day of the year except Christmas and New Year's Day, with children free to come and go as they please as long as they are present during the core school day that runs from 10:30 AM to 3:00 PM. Under the model of individualized instruction, students will learn through iPad apps at their own pace, with teachers serving as coaches to help them reach goals and advance to subsequent levels. As such, the school day never really ends. Pupils are welcome to keep working on their iPads at home, on weekends or on vacation. But as much as the program offers freedom and continuity, it also comes with a substantial monitoring component. The iPad keeps teachers and parents constantly informed about what children are doing, what they have learned and how they are progressing. Teachers, children, and parents meet to discuss goals for each six-week period, setting up standards to help students gain the knowledge and skills to move on to the next level. Dutch researcher Maurice de Hond, the man behind the initiative, believes that the number of schools should grow to at least forty next year, with the schools being publicly funded and open to all children and subsidies available to families unable to afford an iPad. From my experience "go at your own pace" schools just make people slack off and fall below average. I would think a Steve Jobs school would involve a lot more acid. Well, why even bother? Just go all out and let the kids grade themselves. This WOULD NOT work over hear BTW. Just saying. could not agree more. There is a point where trying to be "too forward" thinking is actually backtracking....and this is it. Now THIS is a progression in education. I wouldn't send my kids there. They get enough electronics time at home. I want a strong teacher presence to guide and help them learn not apps and games. That's bold. Really curious to see how this turns out. Can you say "Angry Birds God?" These 4 year olds will rock dem birds like no other. Would Steve Jobs, who loved calligraphy and beautifully written books have those skills be lost by a generation of zombie kids who can use an iPad but can't even write in cursive? Handwriting is essential to young children, so the fact that they don't have notebooks makes this "school" sound like a joke. It's not bold or forward to deprive children of that. It's a step back.